As Christmas quickly approaches, many people are feeling the pinch in their pocketbook. In fact, the National Retail Federation reported earlier this fall that holiday spending is expected to be greater this year, with consumers spending an average of almost $460 on holiday gifts for their family. But let’s be honest, some of us are on a tighter budget and may be looking at a leaner Christmas than the average family. Or we may be trying to stay within our means and avoid going into debt. We’ve shared ways that you can prepare for a frugal Christmas and stay under budget by creating DIY gifts, taking advantage of online deals, redeeming coupons, and more. 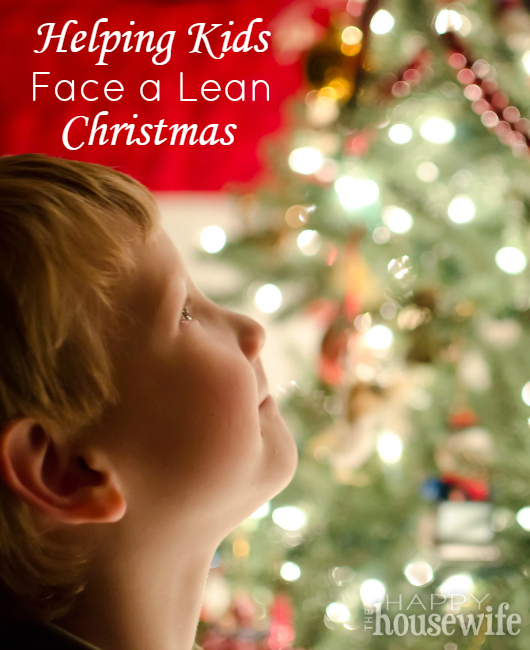 However, if you’re planning a lean Christmas, there may be some disappointment or discontentment to deal with in your children. I turned to Sarah Hamaker, parenting expert at Parent Coach NoVa and author of Ending Sibling Rivalry: Moving Your Kids from War to Peace, for her tips. 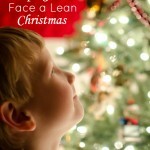 She recommended the following four steps to create Christmas contentment for your family. Getting in the holiday spirit is easy when you are focused on others instead of yourself. Try to incorporate the whole family in giving back to those less fortunate. Whether it is buying a gift for a needy child, making dinner for a family, donating to a local food bank, serving at a soup kitchen, or packing a shoe box for a child across the world, there are many ways to involve your family in giving and therefore cultivating a giving heart. If you take your children out shopping with you, they will likely be bombarded by elaborate displays and plenty of sales gimmicks. Prepare yourself and try to minimize the hectic part of holiday shopping. Remind your kids of how you expect them to act while in the store. Set realistic expectations on how long you’ll be shopping in a particular store and the purpose of that particular trip (i.e., we are only buying one gift for grandma and then we are leaving) as well as if you expect no whining. Before Christmas even arrives, it’s a good idea to declutter the toys in your home. This makes room for new gifts that will make their way into your home this holiday, but it is also a great way for your children to see the abundance of what they have — and don’t play with or even use anymore. Involve your children in decluttering and have them pick out items to giveaway or toss. Clearing out a closet full of toys can be a great reminder of how much they do have. Be sure that you talk about the value and importance of Christmas and all that it means to your family, and do not over emphasize gifts. After all, Christmas is more than just what’s under the tree. As parents, it is important to set the tone and conversations in the home. Continual conversations dwelling on gifts that your neighbors, friends, or extended family received (and what you didn’t receive) will likely make your children focus more on presents. Instead, focus on ways to make memories, create new traditions, and incorporate those meaningful aspects of the holiday for your family. It’s worth noting that if your child is extremely disappointed that (s)he did not receive an expensive item that was on his or her wish list, it is important to acknowledge their disappointment. Finding a way to channel that disappointment into a more hopeful outlook or focus on all the blessings the child does have is key. Keep in mind, a humble Christmas can still result in true joy and wonderful family memories made– and that is priceless!